Lennox (John) Hoyte ’79 grew up in Trinidad, watching his mother—a registered nurse-midwife—care for women and deliver their babies, sometimes in the family’s home. The way she tended to the needs of each individual made a deep impression on him. It was her dream to have a son who would grow up and become a physician. Instead, Hoyte became an engineer—majoring in electrical engineering at WPI and earning a master’s at MIT. It took a decade in the computer chip industry for him to “go back to first principles,” as he puts it, and face his mother’s vision of what he was born to do. “I kept asking myself, ‘Why aren’t you a physician?’” he says. There came a time when the only way he could respond to that question was to become one. Today Hoyte is innovating with an engineer’s mind and doing the hands-on healing his mother envisioned. 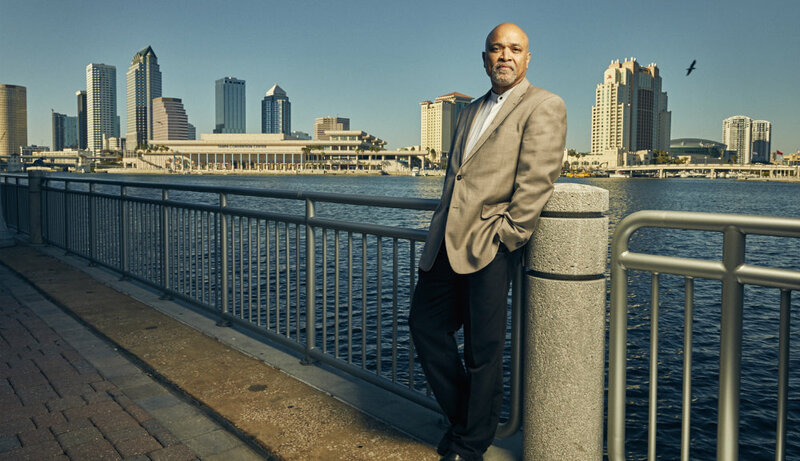 At the Pelvic Floor Institute (which he founded in 2016, with offices in Tampa and Sarasota, Fla.), he treats women who suffer from disorders that are common consequences of bearing children—and of getting older. In his research, he is developing predictive models, informed by high-tech imaging and big data algorithms, that can help women make informed choices about their medical care. “With my background, I was a natural for the OB/GYN specialty,” he says. Though he enjoyed delivering babies, he became intrigued by the biomechanics of the female pelvic floor: what can go wrong, and how to fix it. It was here that the midwife’s son, the engineer, and the urogynecologist found their true work. To understand how the bones and muscles of the female pelvic basin work together to support internal organs, one must fully comprehend their complex anatomy—in three dimensions. Starting in his residency at Brigham and Women’s Hospital, Hoyte began using magnetic resonance imaging (MRI) to create 3-D reconstructions of normal and dysfunctional anatomy. Since then, he’s created atlases and tutorials that demonstrate aberrations in full color, one structure at a time. Over the last few decades, Hoyte has seen greater openness about female pelvic floor disorders, thanks in part to public information efforts of the National Institutes of Health and patient advocacy groups. Yet he still sees patients who come in seeking help for incontinence, prolapse, or sexual dysfunction, thinking they suffer alone. “They’re relived when I tell them their condition is common—and often fixable,” he says. He helps them consider options—which can include observation, physical therapy, or minimally invasive surgical reconstruction. “Surgery is pretty much an ancient art,” says Hoyte. 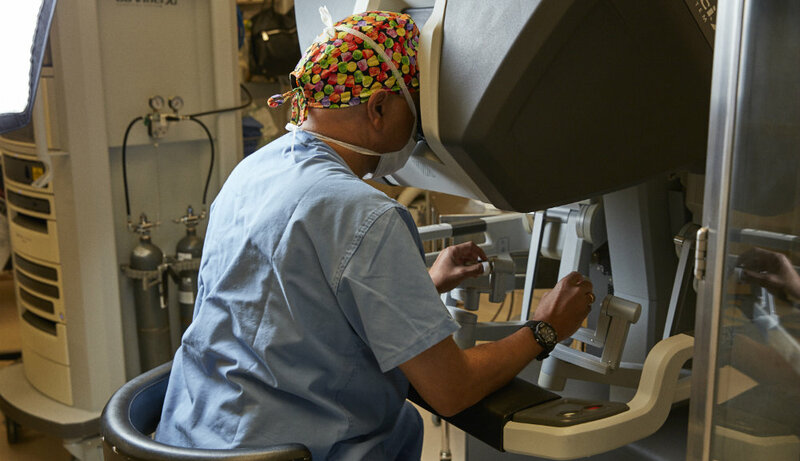 Early in his practice, he observed that the techniques being used for pelvic floor reconstruction “hadn’t really evolved.” While minimally invasive approaches, such as laparoscopy, offered some advantages, he says, “I looked at it with my engineering background and saw that the laparoscope was just not set up to work optimally in the confined space of the pelvic cavity.” He was an early adopter of the robotic-assisted da Vinci Surgical System and has developed specialized techniques and tools that make complex surgical procedures simpler,faster, and safer. Perhaps his most exciting research is in developing 3-D computer simulations of childbirth. “We can pass a model fetal head through the pelvis and look at the damage that occurs—on the computer,” he says. With enough data, Hoyte sees a future in which “we’ll be able to look at a particular patient, get an MRI scan, perhaps do a blood test to assess her biomechanical tissue properties, and run computer simulations of different birth scenarios.” With the right algorithms, he says, “We could tell that woman, based on her baby’s weight and head size, and how long labor lasts, what her risk of childbirth injury would be with vaginal delivery.” He stresses that the goal of his research is to be able to present options, so the patient and doctor can make informed decisions together. The Pelvic Floor Institute is a “testbed” for the HIPAA-compliant electronic medical records software that Hoyte is designing with colleagues. To head up that R&D, he recruited another WPI-trained engineer: his son, Dante Johnson-Hoyte ’13, who serves as the Institute’s chief technology officer. Dante is continuing the family legacy of keeping patient care personal. “My mom was an amazing care provider,” says Hoyte. “My goal in my practice was to build a personalized model of pelvic floor care, where the ‘engineer’—that is, the doctor—listened carefully to the patient to help define what her individual problem is—and then set about solving that problem.” It’s an approach he says harks back to the competency exams that WPI students took in the 1970s. It’s a vision that would make his late mother proud. Hoyte began innovating at WPI with his senior project, “Computer-based Patient Monitoring,” (futuristic in 1979). Since then he’s responded to the needs of patients and physicians with novel improvements to practice and education. Instead of scolding a patient who didn’t want to wear a urine collection bag after surgery, Hoyte developed and patented a portable push-button device that can easily be emptied by the patient throughout the day. The patented Hoyte SacroTip positions and stabilizes organs during surgical repairs, making suturing faster and more accurate. Biomechanics of the Female Pelvic Floor (Elsevier, 2016, co-edited with Margot Damaser) is the first textbook to bring bioengineers and clinicians together in a holistic approach that integrates engineering principles, radiology, physiology, anatomy, and computer science. In addition to numerous scholarly publications, Hoyte has written two plain-language books for patients to guide them through robotic surgery, from decision making to recovery.